Populate field allows the user to automatically add unique data into a specific subject field. 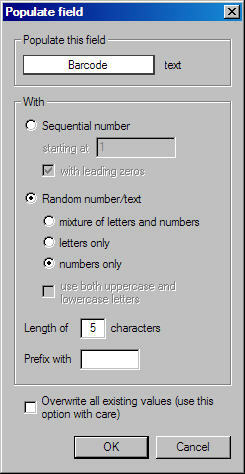 Populate field is therefore ideal for providing a subject with a unique ID where none is available or for assigning a password to each subject for the purposes of online ordering for example. However its use is not limited to the two examples above and can be used whenever the need arises to assign either a sequential number or random string of numbers and characters to every subject. Furthermore each value can be prefixed with a fixed value - a job ID for example. The Populate field window appears. Select the field to be populated and the parameters of the data to populate it with.